Happy Friday, My Lovelies! SO HAPPY it's the weekend. YAY! What a difference a week makes. Last weekend it was ice and snow, and this weekend we're enjoying sunshine and temperatures in the seventies. We're planning a movie night outside on our patio, and I can hardly wait. 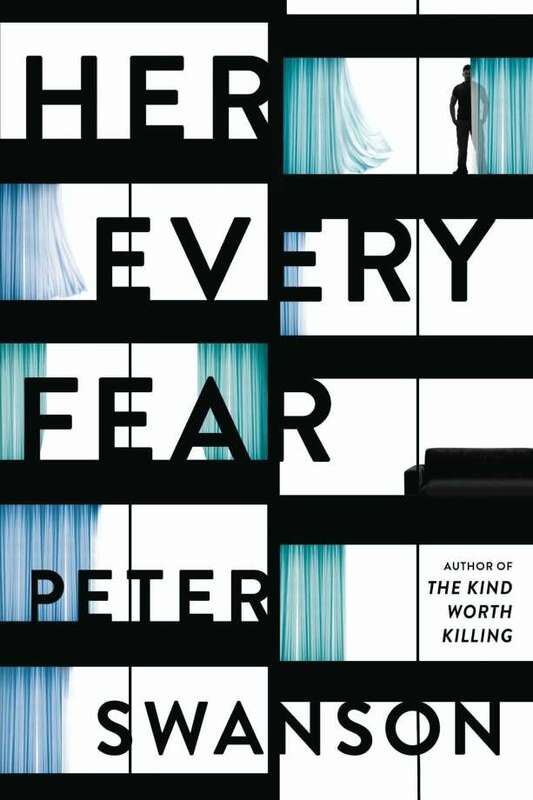 This week I read Her Every Fear by Peter Swanson. It's a suspense thriller I couldn't put down. Not to take anything away from the book, but one of the main reasons I kept reading is I was too scared to turn off the lights! The author of the wildly popular The Kind Worth Killing returns with an electrifying and downright Hitchcockian psychological thriller—as tantalizing as the cinema classics Rear Window and Wait Until Dark—involving a young woman caught in a vise of voyeurism, betrayal, manipulation, and murder. The danger isn’t all in your head . . . Growing up, Kate Priddy was always a bit neurotic, experiencing momentary bouts of anxiety that exploded into full blown panic attacks after an ex-boyfriend kidnapped her and nearly ended her life. When Corbin Dell, a distant cousin in Boston, suggests the two temporarily swap apartments, Kate, an art student in London, agrees, hoping that time away in a new place will help her overcome the recent wreckage of her life. But soon after her arrival at Corbin’s grand apartment on Beacon Hill, Kate makes a shocking discovery: his next-door neighbor, a young woman named Audrey Marshall, has been murdered. When the police question her about Corbin, a shaken Kate has few answers, and many questions of her own—curiosity that intensifies when she meets Alan Cherney, a handsome, quiet tenant who lives across the courtyard, in the apartment facing Audrey’s. Alan saw Corbin surreptitiously come and go from Audrey’s place, yet he’s denied knowing her. Then, Kate runs into a tearful man claiming to be the dead woman’s old boyfriend, who insists Corbin did the deed the night that he left for London. When she reaches out to her cousin, he proclaims his innocence and calms her nerves . . . until she comes across disturbing objects hidden in the apartment—and accidently learns that Corbin is not where he says he is. Could Corbin be a killer? And what about Alan? Kate finds herself drawn to this appealing man who seems so sincere, yet she isn’t sure. Jetlagged and emotionally unstable, her imagination full of dark images caused by the terror of her past, Kate can barely trust herself . . . So how could she take the chance on a stranger she’s just met? Yet the danger Kate imagines isn’t nearly as twisted and deadly as what’s about to happen. When her every fear becomes very real. And much, much closer than she thinks. Peter Swanson is the author of The Girl with a Clock for a Heart. He has degrees from Trinity College, the University of Massachusetts at Amherst, and Emerson College. He lives with his wife in Somerville, Massachusetts, where he is at work on his next novel. Find out more about Peter on his website and follow him on Twitter. Her Every Fear does remind me of my favorite Alfred Hitchcock movie Rear Window due to the setting complete with a courtyard apartment complex, the voyeuristic plot, and two beautiful blondes: Audrey, the murder victim, and Kate, the neurotic English cousin of Kate's next door neighbor Corbin. Kate seems to be a freak magnet. Her overbearing and sociopathic boyfriend from university becomes obsessive and abusive. After Kate breaks-up with him, he stalks her and violently threatens to kill her, only to lock Kate in a closet while he blows his own brains out. If that isn't enough, the moment Kate arrives at her cousin's apartment in Boston she meets one of Audrey's friends who's concerned because she hasn't been able to reach Audrey and fears foul play. When Audrey's body is discovered, Kate becomes even more paranoid, and her jet lag and anxiety disorder isn't helping her mindset. Kate is an artist, and she enjoys sketching people best. She has a photographic memory; she can sketch anyone hours later extremely accurately. Whenever she looks back at people she's sketched while in Boston, she notices subtle changes in her sketches. Is her memory failing her, or is she being gaslighted? I found it odd that she would question her abilities, but exhaustion coupled with anxiety does a number on her confidence. Adding to her terror is Sanders the cat: He's allowed to roam all over the apartment complex (the owner lives down the hall from Kate). Kate seems to have difficulty remembering whether or not she's let him out of the apartment because whenever she's convinced she's let him out, she notices him roaming around the apartment later. I enjoyed the plot twists and turns as well as the multiple points of view. The structure of the novel is basically this: A character will tell you the story given a specific timeframe, and then another character will tell his or her story during the same time. Although there is a bit of back peddling in the plot it's necessary to see what other characters are doing at the same time. Mixed in with this structure are flashbacks from Kate and Corbin's lives. There's a twist at the end from a minor character's point of view that truly gave me itchy underarms. If you enjoy this genre then you must read Her Every Fear. I highly recommend it, but you might want to get a yappy dog before reading it or you might not be able to turn out your lights and sleep! Disclosure: I received a copy of Her Every Fear from the publisher via TLC Book Tours in exchange for a fair and honest review. Ha, liked the added review regarding dogs. ;-) This one sounds interesting. Adding to the list. P.S. What movie did you watch? Your review intrigues me and I really need to be reading more. I'm laughing about your comments about cats and dogs. HA! I read Swanson's last book, and this sounds even better. I'll be picking this up for sure!